Girl joined her classmates and teachers for a field trip to Pizza Hut and Beryl Chocolate Factory today. Was she excited or was she excited?! They put together their own Hawaiian Chicken Pizza in personal pan size, and ate it for lunch. Girl was quite sure she had added a lot of cheese and very little chicken but ended up with a pizza with little cheese and lots of chicken. Haha! The chocolate factory was a little overwhelming for Girl (bean to finished product presentation) as she confessed during home time. Excitedly, she showed me her purchase of the day - 2 chocolates wafer boxes. 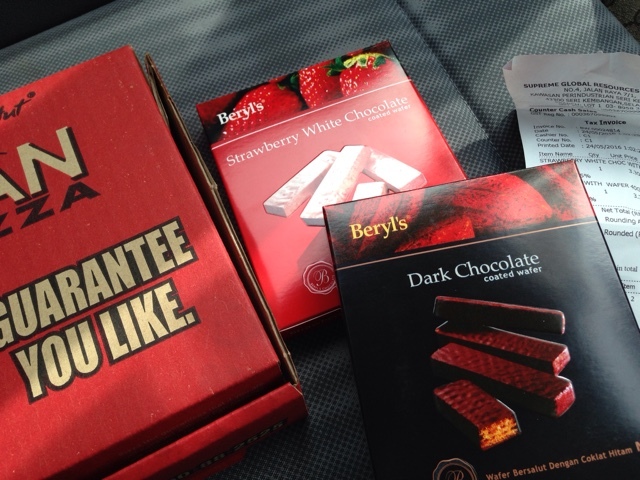 Strawberry for her and dark chocolate for me. How sweet (literally and figuratively!). The budget was RM20. She paid the correct price and brought home the accurate change. That is great for Applied Math, hurrah! I am glad the trip went well and everyone returned safe and happy. Why was the choc factory overwhelming?